The Cook’s Illustrated Guide to Grilling and Barbecue – Excellent reference for best practices and technique. Not necessarily the most inventive recipes, but many provide great bases to add your own flourishes to. 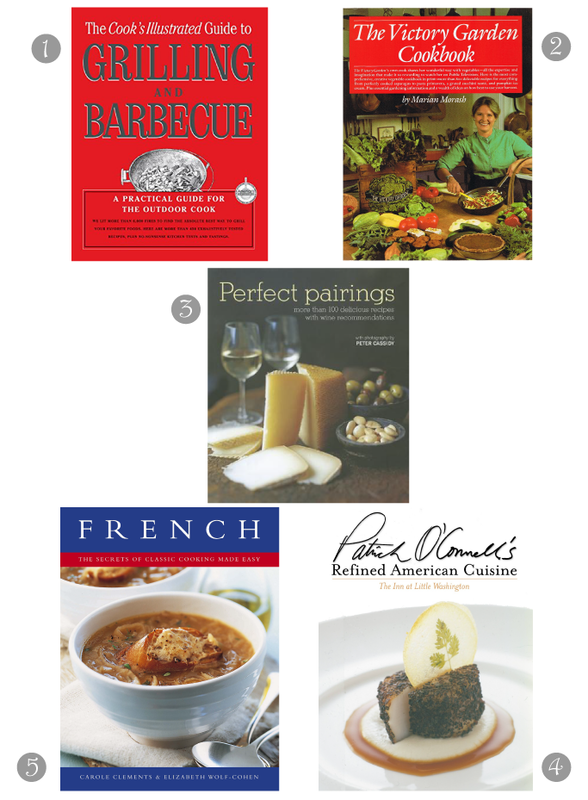 Perfect Pairings – An excellent collection of seasonal recipes and, of course, wine pairings to go with. Some of our favorites from this book include Pumpkin Soup with Honey, Sage, and Pancetta and Mushroom Dauphinois Potatoes. Patrick O’Connell’s Refined American Cuisine – A fancier, yet still approachable selection of recipes by the Inn at Little Washington’s chef and proprietor. We love the Striped Bass with Gazpacho Sauce and Roasted Garlic Cornbread Madeleines. French: The Secrets of Classic Cooking Made Easy – Exactly as the title states, this book includes all the French classics. B and I have come very close to making every recipe in this book and not a single one has disappointed. Favorites include Pepper Steak and Quiche Lorraine. We’re always on the hunt for new cookbooks – what are some of your faves? I would love to try some of the French classic recipes. Have a nice week!